Better Than NEW! Move In Ready! 3 bedrooms + study/den, 2 bathrooms, full walk-out basement and numerous upgraded finishes throughout! This beautiful ranch style home showcases custom hardwood flooring, plantation shutters, security system, study/den and expansive 10 foot ceilings. The gourmet kitchen with upgraded custom cabinets, slab granite counters and stainless appliances features a double oven, 5 burner gas cook top, island, breakfast bar and eating space that opens into the inviting family room with ceiling fan and fireplace. 3 spacious bedrooms including a master retreat with walk-in closet and en-suite master bathroom with Quartz counters and high-end tile and finishes. Full walk-out basement w/high ceilings awaits your finishes. Professionally landscaped front & back w/covered patio and deck provides the perfect place for entertaining or casual living. 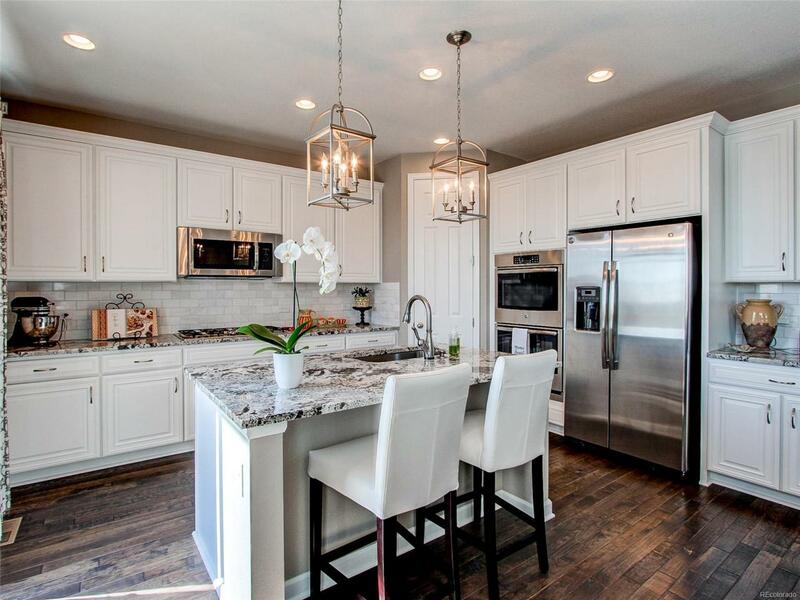 Close proximity to E-470, Southlands Mall, DIA and Aurora Reservoir. New Altitude Elementary School opening in October 2018!